These paintings are chromatic organisms, entirely of its own kind. On the one hand, they assert their obligation with regard to tradition, on the other hand they celebrate individuality and boundless independence, as if they never heard of the great role model they quote. And the beholder, the more he tries to solve this contradiction, produces déjà-vu- and ’aha’- effects, as if the reception of art had to assure itself of its basic premises time and again. who would not, while looking at the painting of Susanne Kamps, think of Matisse, Dufy, Derain and the Fauves with their groundbreaking con- cept of liberating color and shape of any prima- rily object-depicting function? Of their rapture for the light that is captured in their paintings just like it is in those of the artist from Düsseldorf? Motivic and formal parallels can not be denied. in “La Joie de vivre“, this life-affirming initial work, Matisse celebrates a lavish feast of color; a mood coinciding with that of Susanne Kamps, when she works in Southern France. There, where she sharpens her sentiment for color, where she feels its expressive value, where she experiences while painting how the light awakens the color to life and herewith also her paintings. Landscapes satiated with light come into being here, harbor views, sun-drenched ateliers, interiors, still lifes, window views as extensively fulminant abstractions of color, shape and ornament. This is one aspect of her work; the post-modern art- and substantiality reference with regard to the reality of the 21st century is the other. A belief in progress that has turned obsolete and fragmented world views determine the human being today, who self-ironically, self-referentially, with the attitude of a synthesizing puzzle freak, builds reality and truths himself, who cites tra- ditions without being able to deduce a new, meaningful identity. “i am the model!“, this euphoric self-affirming claim by henri Matisse applies even more to- day and at the same time differently than ever before. On the one hand, each individual has to patch together what an industrial society based on growth produces: deregulated labor markets, de-structured life situations, an economical eco- logical system full of risk. On the other hand, this is exactly where the chance to survive lies. Only in the permanent, creative adaptation of biographical designs to ever-changing life situa- tions, the modern self develops its resistance, in the indomitable “nevertheless and Regardless“. how does Susanne Kamps deal with these facets of life in her paintings? She transports quotations of her art-historical role models into the present, in order to leave the influence that determined their style behind her, and in order to consistently realize the motto of modernity “i am the model!“. As the location, she chooses the private space, implying memories of travels. There are the atelier paintings, overly full biographical landscapes, in which each object takes up its distinctly own, living place, of course, with great serenity: a wedge-shaped, saffron-, lemony to orange-yellow tabletop expands with colored dots, carafe, small chest, ceramic, glass jars, chairs, books, flower- and fruit still lifes in a florally structured magenta- to crimson-red interior, the verandah door remains shut in complementary, cold green. in other interiors, the artist drapes clothes and underclothes, coincidentally, maybe recently cast off, scarves, sweets, plump exotic fruits on pink blankets across the Moroccan mosaic floor, blue-green dotted, which intensifies colors and promises compositional support, before the gaze rests in cascades of dancing cherry blossoms outside the window. Outside and inside, spaces and color chords penetrate and enhance each other. An orgiastic, pleasure-oriented play takes place freely in private with languorous color perceptions, synesthetics, dissonances and quiet shrill queer undertones that could not be more borderline. in other paintings, the atelier assumes an in- dependent existence as a pure landscape of comforts, revealing insights as well as a view, and in addition lots of inviting details: blankets, decorative cushions, cozy sofas, cannikins, mugs, slippers, mirrors, lamps, ranging to Japa- nese delicatessen and the cat Bijou, roaming the rooms languorously with a bright red nose. Pure relaxation and luxury, a tasteful invitation to the delightful life, in whichever direction one glances. intertwining color, shape and space into chromatic rhythmized arcs of suspense of every color is an exceptional strength of these paintings. in order to enhance color cascades artistically, Kamps disentangles them from the object, with-out giving up on the same. Details and materia- lity, almost abstracted to a surface ornament, describe the motif, pooling mood and atmos- phere of the moments of lived happiness. when Susanne Kamps quotes Matisse, she at the same time undermines his program. he too has never left the object of his private surround- ings: Because like “a good actor” in different plays, the object too can “play a different role in ten different paintings”1. But while Matisse un- derstands art as a spiritualized form, “i dream of an art of balance, the purity and tranquility with- out any problem, without any disturbing issue”2, Susanne Kamps’ primary interest is the work on color as such, as an expression of what the art- ist describes as her “inner nature”. them ever appearing pretentious or exalted, without any attitude of affected showmanship. Even though she learned theory and practical deployment of color from hermann-Josef Kuhna from scratch and mastered them perfectly, she throws his way of painting overboard. if her teacher places every color dot by dot in mi- nuscule particles on the canvas, granting every color, every paintbrush its own jars and contain- ers, while working on multiple paintings simul- taneously, Susanne Kamps operates differently. She finds her colors within, in feeling out the motif, carrying them around in her mind in visu- ally synesthetizing sentiments, in order to then ultimately try them out, letting them unfold on canvas into a tension-filled mixture, which she soothes and tames so that it won’t explode. 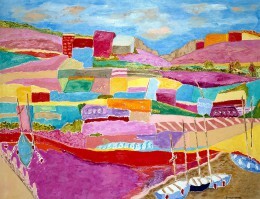 The view of the harbor of Beaulieu-sur-mer is crowned by a private still life in the foreground. The parasol protects the table laid with cloth, small chest, sewing utensils, objects she may have arranged in that particular way there. But this is secondary. They function as attributes in the painting, in order to direct the gaze of the beholder. To connect the private living space with the publicness of the landscape. in this sense, her paintings, interiors, window views and window images as well as the floral and culinary still lifes are psychographic stenographs, snapshots of private happiness, of what is hard- earned, experienced and dreamed of. That she balances them out time and again despite all the queer peaks seems to me a gift of nature, for which the artist just as much as the beholder may be grateful. Joy of living, pleasure and frenzy of colors, the feast of the little things that make life so worth living – Susanne Kamps establishes them as an authentic program. And this takes place here and now in private, viewed with the eyes of a epicurean woman! “25 DEGREES in winTER” is the working temperature!